One of the great pleasures we experienced among the ruins was searching for and finding shards and other artifacts. 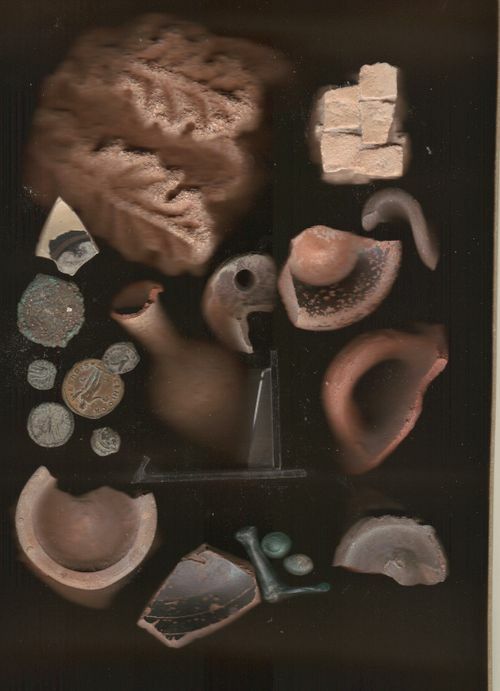 Here you see items that we brought back with us - coins, pieces of a mosaic floor, shards of fine painted pottery as well as pieces of utilitarian vessels. Two particularly fine pieces are the carved acanthus leaves (upper left) that would have been part of a column capitol, and a small clay vial (left of center) that was likely a receptacle for the tears of a grieving family. There were also some small glass items - stones for rings and a stem from a goblet (lower right). Should you be concerned that we violated some law or creed by bringing these items out, let me assure you that there was no regulation and that the local citizens regularly pilfered items for use or profit. When I say "use", this most commonly involved using them to chink the holes in a stone wall of their house.